Have you noticed lately that your aging parent may need more help? Perhaps you’ve seen expired food in their refrigerator? Or a mysterious new dent in the front of their car? Or perhaps they’ve started missing doses of their medication. Having difficult discussions with your aging parent can be tough, especially if your parent is having trouble accepting the fact that they may need assistance. Your goal is to make sure they stay safe and healthy, but they may not see it that way. Having difficult discussions with your aging parent can be easier if you know how to approach the topic. So, how do you have these tough, sometimes uncomfortable conversations? The best time to start “the talk” is before the first sign of a problem. It’s best if your parent is still in good health, independent and active. If problems have already begun, it could lead to certain health issues, which may require an immediate change in their lifestyle. So, it’s best to step in as early as possible. Make sure your parent understands you are taking the initiative so that they can maintain the best quality of life possible. Formulate your thoughts in advance and have a basic idea of what you are going to say. Prepare some notes so that you won’t forget the important points you want to make. Remember, offering multiple solutions will give your loved one peace of mind and allow them to feel like they have a say in what’s best for them. Also, know what potential resources exist in your community so that you can provide the best options. If you have siblings or other family members who need to be part of the conversation, include everyone in the family who should be there. Set aside plenty of time, and make sure all family members can be present to focus on the conversation at hand. Put yourself in your parent’s shoes. Listen to them. Speak to them with respect and dignity, and treat them like adults. Give your parents some control, offer as many options as possible and explain the benefits of assistance. You are doing this because you care! It’s not easy to talk to your parents about what you think is best for them. It can be hard to suddenly be in the dual roles of both child and caregiver. Focus the conversation around the most important concerns you have: health, safety, freedom, peace of mind. Discuss what you’ve observed and be honest about your worries. When someone you love can’t take care of themselves like they used to, you worry about their health and safety and their quality of life. And you wonder about how they will feel when you bring up these concerns. But having these important conversations early and often may reduce anxiety and prevent a crisis down the road. If you are worried about a parent’s driving, consider driving safety classes for older adults. AAA offers driver improvement courses to help senior drivers improve their skills and stay safe behind the wheel. If you need to have difficult discussions with your aging parent about long-term care, this guide for families provides numerous tips on how to make this sometimes challenging conversation – and decision – easier. A tidy home is a happier, more comfortable home. 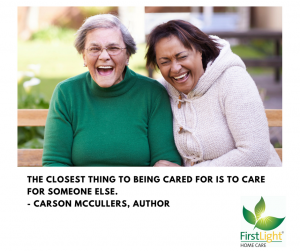 FirstLight Home Care can provide Companion Care Services, such as light housekeeping, to seniors who are having trouble keeping the house clutter-free. We can also help with medication reminders, meal preparation, errands and transportation.